Size: 4.6" x 2.7" x 0.55"
The Canon Palmtronic 8s, also known as LD-8s, followed the LD-84 and uses a much smaller housing similar to the LC-8M with a yellow LC-Display. The engineers at Canon used some tricks to achieve an overall thickness of only 0.55". 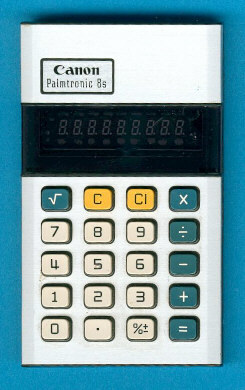 The calculator chip, a TMS1042 based on the TMS1000 Microcomputer family, is soldered with bended pins on the printed circuit board and the green VF-Display uses straight pins. Funny to know that the Palmtronic 8s sports a hidden memory, view the Palmtronic 8Ms and Palmtronic 8Rs using the same calculator chip. Don't miss the TI-2550 III introducing the TMS1043 calculator chip runing from just one AA-sized NiCd battery. © Joerg Woerner, December 8, 2002. No reprints without written permission.